آب‏های زیرزمینی یگانه منبع تأمین آب برای میلیون‏‏ها‏ نفر در جهان است و آلوده شدن آنها تأثیرات عمده‏ای بر سلامت انسان‏‏ها‏، فعالیت صنایع، کشاورزی و محیط زیست دارد. آب شرب شهر قم از طرح‏‏ها‏ی انتقال آب از حوضه‏‏ها‏ی مجاور و چاه‏‏ها‏ی شرب حفر شده در محدوده شهر تأمین‏ می‏شود. کمبود منابع تأمین آب و‏‏ ‏نیاز آبی شدید در شهر باعث شده چاه‏‏ها‏ی شرب داخل شهر نقش مهمی که در گذشته در تأمین آب شرب شهر داشته اند، کماکان حفظ کنند. نیترات به‌عنوان آلاینده‌ای گسترده و متداول آب زیرزمینی از فعالیت‏‏ها‏ی انسانی و شهری منشاء‏ می‏گیرد. آلودگی ‏‏آب‏های زیرزمینی ممکن است برای سال‏‏‏ها‏‏،‏‏ غیر قابل تشخیص باشد. احیای آبخوان‏های آلوده مشکل‏‏،‏‏ پر هزینه‏‏،‏‏ و در برخی اوقات غیر ممکن است. به‌منظور ارزیابی غلظت نیترات چاه‏های آب شرب شهر قم از نتایج آنالیز 600‏‏ ‏نمونه آب‏ که توسط شرکت آب و فاضلاب قم در طی سال‏‏ها‏ی 1385 تا 1392 برداشت شده،‏ ‏استفاده شد. 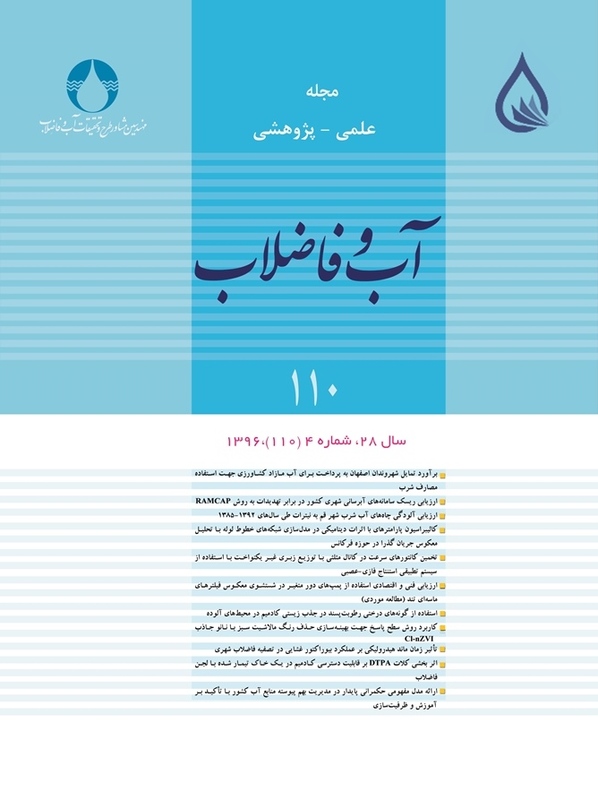 در این آنالیزها 136 نمونه آلوده وجود داشت. همچنین به منظور اطمینان از نتایج آزمایش‏‏ها‏ی شرکت آب و فاضلاب و تعیین محل ‏‏ها‏له آلودگی در آذر ماه 1392 از 27 حلقه چاه عمیق در محدوده شهر نمونه‌برداری و آلاینده‏‏ نیترات در آزمایشگاه معتمد اندازه‌گیری شد. در این نمونه‌برداری میانگین غلظت نیترات نمونه‏ها 74‏ ‏میلی‌گرم در لیتر و انحراف از معیار آنها 37 میلی‌گرم در لیتر به‌دست آمد و آلودگی به‌نیترات در‏ 19 نمونه (‏70 درصد ‏نمونه‏ها)‏ مشاهده شد. نتایج نشان داد که آبخوان قم در محدوده شهر قم به‌صورت گسترده به نیترات آلوده‏ می‏باشد. Groundwater is the only vital source of water for millions of people around the world and its contamination has dire impacts on human health, industrial activities, agriculture, and the environment. The drinking water in the City of Qom is supplied from neighboring water basins transferred by interbasin water transimission facilities and from water wells within the city. The growing demands and the consequent increasing water scarcity have augmented and foregrounded the significant role played by the water wells in this city. Nitrate as a widespread pollutant originates from human activities and the dumped wastes that lead to the gradual degradation of groundwater resources, which might go undetected for years. On the other hand, remediation of polluted aquifers is a formidable, cost-intensive, and, at times, impossible endeavor. In this study, groundwater resources in the city of Qom were investigated in terms of their nitrate concentration. For this purpose, 600 groundwater samples collected from 2006 to 2013 by the Qom Water and Sewage Company were used, 136 of which were found to be polluted with nitrate. In order to validate the data thus obtained and to identify the contaminated areas, additional samples were collected from 27 wells in December 2013 and subjected to the relevant analysis. The latter analysis revealed a mean nitrate concentration of 74 mg/L and a standard deviation of 37 mg/L, with nitrate contamination detected in 19 wells accounting for 70% of the sampling sites. Generally, the results indicate that the aquifers within the city of Qom suffer from nitrate contamination. "Nitrate", "Potable water ", "Groundwater pollution", "Qom aquifer"
Bowers, F. H., 2000, "Septic system and nitrate nitrogen as indicators of groundwater quality trends in New Jersey", Dept. of Environ. Protec., New Jersey. Cimenti, M., Biswas, N., Bewtra, J.K. & Hubberstey, A., 2005, "Evalution of microbial indicators for the determination of bacterial groundwater contamination sources", Water, Air, and Soil Pollution, 168, 157-169. Cool, G., Rodriguez, M. J., Bouchard, C., Levallois, P. & Joerin, F., 2010, "Evaluation of the vulnerability to contamination of drinking water systems for rural regions in Que´bec", Canada Journal of Environmental Planning and Management, 53, 615-638. Council of the European Union, 1998, Council Directive 98/83/EC, on the Quality of Water Intended for human consumption, EU. Federal Provincial Territorial Committee on Drinking Water, 2014, Guidelines for Canadian drinking water quality, Canada. Fetouani, S., Sbaa, M., Vanclooster, M. & Bendra, B., 2008, "Assessing groundwater quality in the irrigated plain of Triffa. (North-east Morocco)", Agricultural Water Management, 95(2), 133-142. Fetter, C.W., 1999, Contaminant hydrogeology, 2nd Ed., Prentice Hall Inc.
Fetter, C.W., 2001, Applied Hydrogeology, 3rd Ed, Macmillan Pub., New York. Freeze, R. A. & Cherry, J. A., 1979, Groundwater, Prentice Hall, Englewood Cliffs, NJ. Goulding, K., 2000, "Nitrate from arable and horticultural land", Soil and Management, 16, 145-151. Helsel, D.R. & Hirsch, R. M., 2002, Statistical methods in water resources techniques of water resources investigations, Book 4, Chapter A3. U.S. Geological Survey, US Department of the Interior. Hounslow, A.W., 1995, Water quality data: Analysis and interpretation, CRC Press. Jiang, Y. & Somers, G., 2009, "Modeling effects of nitrate from non-point sources on groundwater quality in an agricultural watershed in Prince Edward Island, Canada", Hydrogeology Journal, 17, 707-724. Joerin, F., Cool, G., Rod riguez, M.J. & Gignac, M., 2010, "Using multi-criteria decision analysis to assess the vulnerability of drinking water utilities", Environmental Monitoring and Assessment, 166, 313-330. Kalantari, N., Rahimi, M.H. & Matoori, F., 2011, "Chemical and biological assessment of water resources of Sia-Mansour area, Dezful", Journal of Environmental Studies, 37 (59), 29-42. Kumar, S.C. & Anderson, H.W., 1993, "Nitrogen isotopes as indicators of nitrate sources in Minnesota sand plane aquifers", Groundwater, 31, 260-271. Lerner, D.N. & Papatolios, K.T., 1993, "A simple analytical approach for predicting nitrates concentration in pumped groundwater", Groundwater, 31(3), 370-376. Lu, Y., Tang, Ch., Chen, J. & Sakura, Y., 2007, "Impact of septic tank system on local groundwater and water supply in Pearl River Delta, China: Case study", Hydrological Processes, 22, 443-450. Lui, Z. J., Hallberg, G.R., Zimmerman, D.L. & Libra, R.D., 1997, "Detecting changes in the spatial distribution of nitrate concentration in groundwater", Journal of the American Water Resources Association, 33(6), 1209-1218. Maila, Y.N., El-Nahal, I. & Al-Agha, M.R., 2004, "Seasonal variation and mechanisms of groundwater nitrate pollution in the Gaza Strip", Environment Geology, 47, 84-90. Majudar, D. & Gupta, N., 2000, "Nitrate pollution of groundwater and associated human health disprders, Indian", Journal Environment Health, 42, 28-39. Obeidat, M.M., Massadeh, A.M., Al-Ajlouni, A.M. & Athamneh, F.S., 2007, "Analysis and evaluation of nitrate levels in groundwater at Al-Hashimiya area", Jordan. Environmental Monitoring and Assessment, 135 (1-3), 475-486. Pacheco, J. & Cabrera, A., 1997, "Groundwater contamination by nitrates in the Yucatan Peninsula Mexico", Hydrology Journal, 5(2), 47-53. Paul, M., Wolf, K., Funda, K., Held, I., Winter, J., Eiswirth, M., Gallert, C. & Hotzl, H., 2004, "Microbiological condition of urban groundwater in the vicinity of leaky sewer systems", Acta Hydrochemical Hydrobiology, 32, 351-360. Petakove, N.I. & Ivanove, A.V., 1970, "Investigation of certain psycho physiological reaction in children suffering from metheamglobinaemia", Hyg. Sanit., 35, 29-32. Qom Water and Wastewater Co., 2013, Chemical analysis of drinking wells in Qom, Qom Province Quality Lab., Qom. Stamatis, G., Parpodis, K., Filintas, A. & Zagana, E., 2011, "Groundwater quality, nitrate pollution and irrigation environmental management in the Neogene sediments of an agricultural region in central Thessaly (Greece)", Environmental Earth Sciences, ‏64 (4), 1081-1105. Todd, D.K. & Mays L.W., 2005, Groundwater hydrology, 3nd Ed., John Wiley and Sons Pub., N.Y.
U.S. EPA., 1993, Wellhead protection: A guide for small communities, Office of Research and Development Office of Water, Washington, DC, (EPA/625/R-93/002). USEPA, 2009, Water standards and health advisories table, USA. World Health Organization (WHO), 2011, Guidelines for drinking-water quality, 4th Ed., WHO, USA. Zhang, H. & Hiscock, K.M., 2011, "Modelling the effect of forest cover in mitigating nitrate contamination of groundwater: A case study of the Sherwood Sandstone aquifer in the East Midlands", Journal of Hydrology, 34, 125-135. Zheng, B. H., Fu, Q. & Liu, Y., 2007, "Environmental problems and solutions for public drinking water sources in china", Environmental Protection (Chinese), 381(19), 59-61.